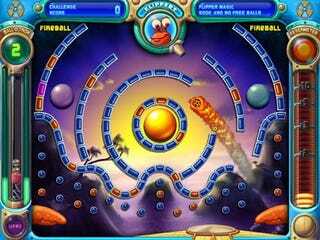 PlayStation 3 owners are in for a double shot of Peggle this Thursday. The North American PlayStation Store adds both Peggle and the expansion Peggle Nights, PopCap Games announced today. We expect that Peggle and the darker, no-more-dangerous Peggle Nights for PSN will feature match the PC and Xbox Live Arcade versions, with Challenges, Adventure modes and replays intact. What the PS3 version brings to the table is the option to upload replays to YouTube, directly from the game itself. Awesome. Price for Peggle? $9.99 USD. Peggle Nights will run you an additional $4.99 USD, once the fun of the original has been sufficiently drained.